The Trilight fan I got didn't had a retail package but I'm sure that they will have one when you buy them in a shop or directly from their website. 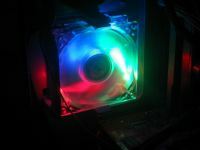 Most LED fans have three or four LEDs which have the same colour (blue, red and green are the most popular ones but you even have white, yellow and purple LED fans). Besides those you also have LED fans with 2 colors mostly red and blue. The Antec Trilight LED fan however combines the best from both worlds and has three LEDs, a blue , green and a red one! The fan has a 4-pin connector and a 3-pin connector. 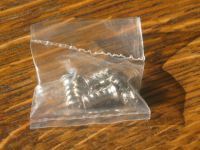 The 4-pin connector has a black sleeving (to help hiding the ugly cables in your case) and is used to provide the fan with some power. The 3-pin connector is used to read out the fan his RPM trough your motherboard. No passtrough Molex connectors, that's what I'm missing here. 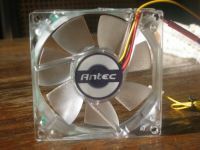 But David from Antec told me that soon all Antec LED Fans will come with a pass trough Molex connector. 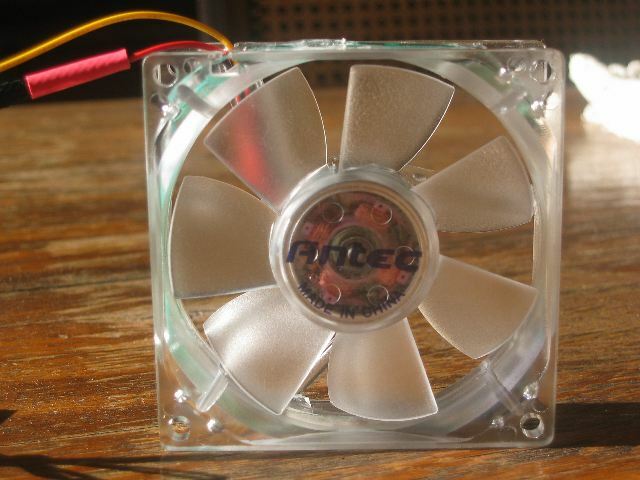 The fan itself is made out of solid clear plastic. Around the fan is a plastic strap like you can see on the third picture. It is used to provide the three LEDs with power. Overall these specifications are like most other LED fans. They aren't super high performance 80mm fans which push out 70CFM or more and produce a LOT of noise. But the Antec LED fans have an average airflow and the noise production is also average. Compared to most other LED fans they have a good noise/airflow ratio. Also included with the fan was a bag with four case screws. Nice that they thought about it! Lol it actually suprised me how much difference this fan gave me! 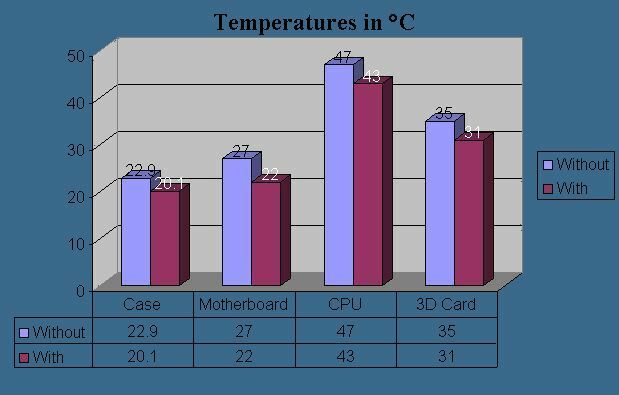 Most temperatures dropped quite a lot, especially the sensor in my motherboard which reported a temperature drop of 5°C. Also the temperature drop of my CPU and 3D Card (a GeForce 4 Ti 4200) are noticeable, both sensors reported a temperature drop of 4°C. But I think that was because the fan was sitting really close to both my 3D Card and CPU. From my test results I can conclude that it has a good performance, but does it looks well? Because that's also an important reason to buy a LED fan, the looks. I think this fan looks very good, I've taken a few photos so you can see how cool it looks :-) The light effects are cool, even in daylight. Antec is known for their high quality products and this is surely one of them! It doesn't only looks cool, but it also makes your PC cooler! Overall I like these fans, they aren't priced too high, only a little bit higher than most normal 80mm fans. The only thing that could stop someone from buying one of them is that the noise that these fans produce is a little but too much to put in a really quiet computer. Price is $9.95 at the Antec Store (for US and Canada), take a look here if you live in another country. "Antec invented the LED Fan (the type with the LEDs in the shroud pointed in at the fan blades). 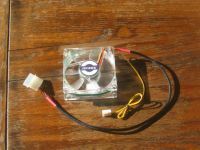 We hold the patent on that style of LED Fan, regardless of the number of LEDs (3, 4, 12, it doesn't matter). 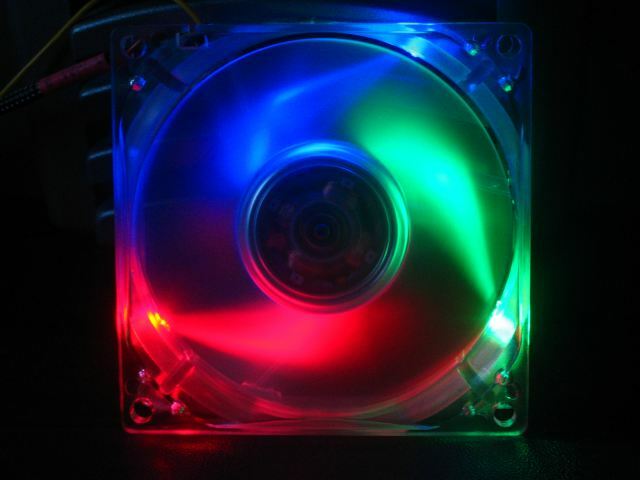 There are a number of illegal pirates on the market, but the only other legal LED Fan I'm aware of is the one with the two LEDs in the hub, pointing out of the fan. It doesn't seem to be a very popular design." A Press Release about this issue can be found here. I honestly didn't knew this and I would like to thank Antec for pointing this out. A lot of company's seem to be violating this patent though.. 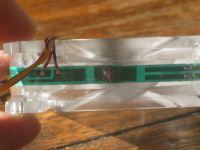 It goes to show what a low and pityful world this is, if you have to patent LEDs in a fan, serving no other purpose than inducing wet dreams in geeks who really ought to know better. If something worthwhile had been patented, perhaps, maybe, people would have a case, but this is going way beyond ridiculous. I got 4 of the blue LED fans from antec in my PC and i love them! I recently got into Xbox modding, and i decided to put in some led fans and a choose antec, i was debating wither to get just the green led fand or the trilite, after reading this article i was pleased that i choose the trilite but the only down side is that it was a lil bit noisy but not that bad, and it mad my Xbox alot cooler. Btw i am running Linux on my Xbox b/c Linux ownes M$.